BACKGROUND: Fine needle aspiration biopsy (FNAB) has been shown to be the diagnostic procedure of choice for superficial lymphadenitis in tuberculosis endemic regions. METHODS: We conducted a retrospective laboratory-based study to determine the bacteriological yield of clinically suspected mycobacterial tuberculous lymphadenitis following FNAB in adults, and specifically HIV-positive patients, to determine the need for the introduction of automated nucleic acid amplification tests (NAATs) such as the Xpert MTB/RIF assay as the initial diagnostic modality. RESULTS: A diagnostic yield of 80% was achieved, significantly higher in HIV-positive v. HIV-negative patients (84% v. 52%, respectively; p<0.001). CONCLUSION: The results justify using automated NAATs such as the Xpert MTB/RIF assay as the initial diagnostic modality to expedite management in HIV-infected patients. Tuberculous lymphadenitis (LAD) is the most common form of extrapulmonary tuberculosis (TB), accounting for 30 - 52% of cases of peripheral lymphadenopathy in developing countries with a high TB incidence. [1-3] In high-incidence countries, it is usually considered a disease of childhood, while the peak age of tuberculous LAD in developed countries such as the USA has now been shown to be 30 - 40 years. With this background, a retrospective laboratory-based study was conducted to determine the bacteriological yield of clinically suspected mycobacterial LAD in adults, and specifically, HIV-positive patients, to determine the need for introduction of automated nucleic acid amplification tests (NAATs), such as the Xpert MTB/RIF assay as the initial diagnostic modality. The study was conducted from May 2007 to March 2010 at the Tygerberg Hospital FNAB clinic. Ethical approval was received from the Stellenbosch University Health Research Ethics Committee (ref. no. S12/07/202). The study population included adults, >14 years of age (as defined in SA), referred to the FNAB clinic for suspected mycobacterial LAD, where cytomorphology was consistent with mycobacterial disease. FNABs were performed by the trained sister or pathologist using a23 G or 25 G needle attached to a 10 ml syringe. Two aspirates were performed, and the syringe rinsed in Mycobacterial Growth Indicator Tube (MGIT) medium for mycobacterial culture. Samples inoculated into MGIT were cultured according the standard operating procedure in the automated BACTEC MGIT 960 system (Becton Dickenson, USA). Cultures were incubated at 37°C for up to 50 days or until flagged positive. A positive cytology diagnosis included cytomorphological features consistent with mycobacterial infection and confirmation of the organism on Ziehl-Neelsen stain or Papanicolaou autofluorescence. A total of 368 patients were included. Of these, 226 (61%) were HIV-positive, 25 (7%) HIV-negative and in 117 (32%) patients the HIV status was unknown. The numbers of women and men in the study population were 233 (63.3%) and 134 (36.4%), respectively. The gender of 1 (0.3%) patient was not recorded. Mycobacterial LAD (bacterial confirmation) was confirmed in 293 (79.6%) patients. Of these, 228 (77.8%) had positive MGIT cultures while in 65 (22%) cases with negative MGIT cultures, 64 (22%) were diagnosed on Ziehl Neelsen stain, and 1 (0.4%) on Papanicolaou autofluorescence. The average time to culture was 18.6 days (range 4 - 50). A significant difference was found between the diagnostic yield in the HIV-positive and -negative populations (84% v. 52%, respectively; p<0.001). The yield in the HIV-unknown population was 77%. Of the 228 positive cultures, 226 were Mycobacterium tuberculosis, 1 M. avium-intracellulare, and 1 M. szulgai. 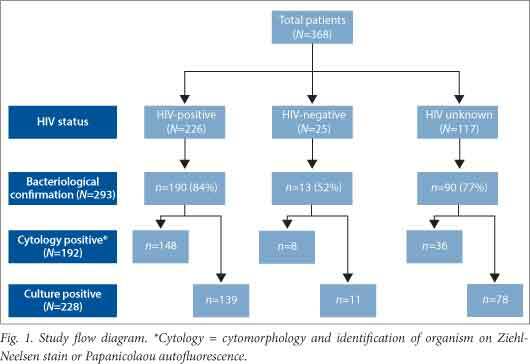 The non-tuberculous organisms were both in HIV-positive patients. A positive culture for M. tuberculosis was obtained in 29/84 (34.5%) patients in whom a sputum sample had been submitted. The HIV status of 2 of these patients was unknown, while 27 patients were HIV-positive. The mean age of patients diagnosed with mycobacterial LAD was 31.9 years (range 14 - 71); with the mean age in the HIV-positive population being 32.6 years and in the HIV-negative population 28.5 years. Multivariate logistic regression analysis showed positive HIV status to be significantly associated with a positive bacteriological yield (p=0.005), independent of other variables included in the model, namely gender, age and site. The odds ratio indicates that an HIV-positive patient has 4.86 times higher odds of having a positive bacteriological yield (95% confidence interval 1.65 - 9.75) than an HIV-negative patient. The relationship between HIV and TB is bidirectional. [1,2] TB is a catalyst in the progression of HIV, and HIV infection is associated with an increased risk of developing TB. HIV alters the clinical presentation of TB such that TB progresses more rapidly and aggressively in HIV-infected individuals. Sputum smears, which are the cornerstone of diagnosis in resource-limited settings, are usually negative in HIV-associated TB, attested to by the 34.5% sputum culture yield in this study. This contributes to the diagnostic delay in treatment. [1,2] Extrapulmonary TB can occur either alone or in association with pulmonary TB in 40 - 60% of cases. [1,2] FNAB provides a means of easy access to diagnostic material in many of these pulmonary cases. This study shows that the bacteriological yield of FNAB in suspected mycobacterial LAD in adults is comparable to, and higher than, that found in children in TB-endemic areas. Compounding the problem of HIV and TB co-infection is immune reconstitution inflammatory syndrome (IRIS) where the initiation of antiretroviral treatment (ART) 'unmasks' the clinically silent disease.M. tuberculosis is estimated to account for about one-third of HIV-related IRIS events. To avoid IRIS complications, ART is ideally initiated once mycobacterial infection has been excluded, but diagnosing TB using current diagnostic modalities has limitations. In this study, the average time to culture was excellent at 18.6 days, but this delay in initiating treatment increases the contagious risk, particularly in resistant disease. In endemic areas, patients with granulomatous inflammation are often treated empirically with anti-TB drugs, contributing to the generation of multidrug-resistant TB. The heavy burden of TB, and HIV, in countries such as SA places a strain on scarce resources, which can be alleviated with a rapid diagnosis that reduces the number of follow-up visits. Given the high diagnostic yield of mycobacterial LAD in HIV-infected adult patients on FNAB, and the pressure to expedite diagnosis, we feel this justifies recommending new automated NAATs such as the Xpert MTB/RIF test to be used as first-line diagnostic modalities. The Xpert MTB/ RIF test has been shown to be of value in the diagnosis of extrapulmonary TB, including tuberculous LAD. [11,12] The advantages include minimal sample size, and ease and rapidity of diagnosis. The rapid turnaround time will, in turn, reduce the need for hospitalisation, reduce the contagious risk and decrease morbidity and mortality associated with the high TB burden in SA. Acknowledgements. The authors express gratitude to Sr Cupido for her dedicated and efficient service at the Tygerberg Hospital FNAB clinic and to Justin Harvey, Department of Statistics and Actuarial Sciences, Stellenbosch University, for the data analysis.